Medications Shown: The first 5 (from left) are for parasitic problems: Hex-A-Mit, Ick-ease, Life Bearer, Aquarisol, Medicated flakes; next 3 for fungus: Fungus Control, Fungus Guard and Fungus Cure; next 2 antibiotics: Maracyn and Maracyn-Two. 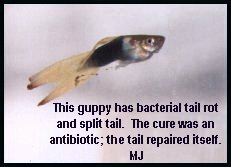 There are many diseases that can attack a guppy. 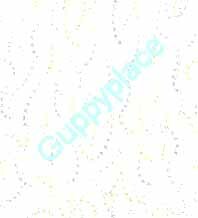 Here I will attempt to explain some of the most common ones that guppies experience. Note: for information on parasites, see the article Parasitic Problems. Fungus is actually a colourless plant which appears as a whiteish cotton-wool look on the guppy body or fins. Fungal diseases normally only attack weak guppies where they have had damage to the skin or gills, or when their slime layer has been weakened for some reason (such as a previous bacterial problem). Fungus also occurs when guppies are kept in tanks that are too cold. Saprolegnia fungus seems to be a culprit in the death of fry, attacking the gills and causing massive deaths even before symptoms show. Jungle's "Small Fish Saver" is made to combat this problem. Salt: Add salt at the rate of 1 teaspoon per gallon; if you normally add salt, double the amount you usually use. In a hospital tank you may want to follow the Salt Treatment as described at the bottom of this page. Methylene Blue: This is a bluish organic dye useful for combating fungus and some external protozoan infestations: Costia, Chilodonella (Sliminess of the Skin), Saprolegnia (fungus), Trypanosoma (blood parasite, rare in aquariums). It also reverses nitrite poisoning by aiding oxygen transfer across the gills. Methylene Blue can be used in shipping water to help provide protection from fungal infections due to damage and help oxygen transfer, reducing the possibility of nitrite poisoning. Considerations: Continuous treatment over the course of several days is needed; Methylene Blue will damage plants; it must be used in a hospital tank (it destroys the helpful bacteria in the biological filter) without organic matter (which easily deactivates it). It also discolours aquarium equipment, including silicone sealant. This seems to generally be a bacterial problem in guppies, however fin nips by aggressive tank mates or damage from sharp ornaments can cause physical damage to the tail and fungus sets in. It is important to distinguish which problem you are really dealing with before imposing medication. Fungus can also be a secondary problem that sets in after damage occurs from a bacterial disease, which should be kept in mind. A fish with an obvious bite out of it's tail or a split that has acquired a white edge, has been infected by fungus. Medication for fungus should be used in a well-aerated hospital tank . If there has been no obvious damage to the tail and the edge shows disintegration and shredding (usually with a light-coloured edge), it should be assumed to be a bacterial infection. The tail sometimes will show a red or discoloured edge as shown in this photo. This is often simply a sign of poor water quality (sometimes called "ammonia burn") for one reason or another that affects the delicate caudals of fancy male guppies. Removing the fish to better quality water or making a number of water changes may remove the discolouration. However, most guppies experience true bacterial tail rot and the fish should be separated and treated with an antibiotic such as Tetracycline, Maracyn or Maracyn Two. There are two forms this takes but both look similar, and both are caused by a bacterial infection. With one, the scales protrude from the body (like a pine cone) and with the other, the body swells with fluid which causes scale protrusion and protruding eyes. Actually, "dropsy" describes the symptom in reality, not the disease itself. Unfortunately, it is extremely difficult to cure. The fish should be isolated immediately, and destroyed if its condition does not get better. By the time the scales protrude, the internal organs including the liver have been damaged to the point of no return. The cause is what the fish keeper should investigate to avoid another case of dropsy. Poor water conditions, weakened fish and feeding too many bloodworms may also be part of the problem. This looks similar to fungus, but is actually caused by one of two types of gram-positive bacteria. Its causes are not really understood, but it may arise due to crowded tanks, poor water conditions, inadequate filtration, or poor water circulation (aeration). It manifests itself in the beginning of the disease as a whiteish area where the pigment appears gone, usually on the peduncle or the body's middle area ("saddleback columnaris"). The guppy will later show difficulty swimming as the body slowly becomes paralyzed. Most often this affects female guppies for some reason, and it is highly infectious -- it can destroy all the fish in the tank if the affected fish is not removed. To cure columnaris, treatment must be initiated as soon as symptoms show. Breeder Stan Shubel has cured columnaris with a formalin (37%) dip, then leaving the fish in a tank with two drops of this formalin per gallon for a few days. Strong aeration is a must with the treatment. Formalin is a strong chemical which I do not advocate the use of; see more information under Fluke Treatments (Parasitic Problems). A wide-spectrum antibiotic such as Maracyn is an alternative. I have personally cured columnaris by making 2 large 50% initial water changes, then adding salt over the course of 3 days to triple the amount the fish are accustomed to. In a few days you should see vast improvement if not a complete cure. Leave the salt in the water until the fish look completely clear of the disease, and then remove the salt (or return the formerly-used concentration) by doing a few water changes over the next week. This is the safest possible remedy and one that I wholeheartedly endorse, since salt is safe for fish and humans. Potassium permanganate (KMnO4), an oxidizing agent, can be used as a short-term bath (30 minutes at 10 mg/L). Careful observation of the guppy is important to avoid mortality since it is a very strong chemical. Potassium permanganate should not be used more often than once a week to avoid gill or mucus damage. This appears as a white edge around the mouth. This is usually columnaris (a bacterial disease) in most fish, but in guppies and other livebearers, it is usually a true fungus. Treat as fungus, however, keep in mind that it may be Columnaris. Make sure you quarantine the fish and treat in a hospital tank. This condition may lead to blindness and loss of the affected eye(s). Pop-eye does not spread easily to other fish so unless you are medicating with a wide-spectrum antibiotic, there is not really a need to separate them. It cannot be treated unless you know the cause, of which there could be many. It could be excess gases in the blood caused by super-saturation in water from high-pressure mains. This is a condition much like the bends in divers. Are there any bubbles in the eye? Is the guppy acting like it is in distress or moving/swimming strangely? Is it acting nervous? If so, assume this is the problem, and lower the temperature as far as you can within reason to help increase the solubility of the gas (nitrogen) and cut off all aeration. Pop-eye could also occur in relation to infrequent water changes, dropsy, ich, bacterial infection, parasitic fungus, internal metabolic disorders, TB, or even a hormonal imbalance. Treatments with several different medications may be required before a cure is found; however, usually all you can do is hope that the pop-eye goes away. Symptoms: Unnatural, uncontrolled swimming or floating on an angle. 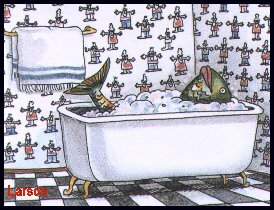 Guppies are not prone to this problem, however it does occur, usually after a stress-related experience. It is difficult to determine the cause for this , but it seems that moving a fish from shallow water to deep water can trigger it, and poor water quality can cause it as well. This is caused by a virus, which is highly infectious. The fish stops eating and cysts are formed at the rear of the abdomen. This distends the body and the fish appears to be standing on it’s head. The body degenerates and chance of recovery is low. The fish should be removed immediately and destroyed. Also appropriately named the Wasting Disease. Fish stop eating, become hollow-bellied, emaciated, grow ulcers, eyes protrude, fins rot, colours pale and the fish becomes inactive. Guppies may live months in such condition. All symptoms will not appear, but be cautious if more than 2 show. TB is caused by mycobacterium bacteria, and is passed from fish to fish by feeding on dead infected fish and feces. Guppies can pass TB to their offspring as well, so it is particularly dangerous and action must be immediate. Remove the diseased fish for observation. If there is no improvement, destroy the fish. Be sure to remove any dead or dying fish from the tank, and quarantine completely. If a number of fish die from TB, tear down the tank and disinfect everything with bleach. TB outbreaks can usually be avoided with proper environmental conditions. TB bacterium is pathogenic to humans. Do not reach into the tank water with bare skin, especially if you have any damaged skin, and never touch a sick/dead fish with bare hands. People who contract TB will endure sores which take weeks of antibiotics to cure. Sometimes, due to aggressive behaviour, netting, shipping, etc., guppies can get damaged bodies and fins. Some hobbiests have used Melafix helpful in keeping fungus as a secondary infection at bay. However, one should keep in mind that this safe, tea tree oil-based product does not have anti-bacterial properties as it orginially claimed on the label. Methylene Blue is another fungus preventative, however it must be used in a bare quarantine/hospital tank. More information is found elsewhere on this site (see Contents page). Caused by bacteria that grow in the blood, this disease appears as lesions, ulcers or sores on the body, reddening at the base of the fins and the vent. The fish will eventually stop eating and may darken in colour. Ulcers may get a secondary infection of fungus. It may be a latent infection, which breaks out when fish are crowded, shipped, or handled roughly. It is important to isolate the fish since they release pathogenic bacteria directly into the water and other fish will be infected. Treat the affected fish and the other apparently healthy fish with an antibiotic medicated food (or flakes with 1% antibiotic carefully mixed in) twice daily if they still eat; otherwise use antibiotics in the tank. I suggest trying Maracyn Two. This is a treatment that is as old as the aquarium hobby itself. Treating with salt is undoubtedly the safest way to treat fishes. While chemicals such as Formalin, Malachite Green, and copper are considered by some to be more reliable, these are strong substances to impose on a guppy and must be handled with care since they have the potential to cause cancer in humans. Using salt is especially handy with guppies, since they are built to withstand a lot of salt - they do that quite well. Salt is especially effective against fungal infections and some parasitic problems such as ich. If diagnosis is difficult, try salt. Normally the salt treatment lasts 10 days. Note: This bath is not intended as an additional treatment and should not be combined with other medication. Days 4 - 7: Leave water alone. Days 8 - 10: Remove half of the tank water each day and replace with unsalted, chlorine-free water at the correct temperature. If by day 7 you see any improvement (but not a total cure), wait until day 10 to start changing the water in the tank. Be sure to change half the water once a day, for three days at the end of the salt treatment. Also, don't wait longer than 10 days to start changing the water, as the salt itself can begin to cause problems for your fish. I suggest you read the page hospital tank for basic information on administering treatments! See Parasitic Problems for more diseases.